As the 2013 Legislature begins its work the discussion remains focused on implementing last year’s tax reform package. A new study from Kansas Policy Institute makes clear a good deal of the dollars necessary to implement reform without raising taxes, an 8.5 percent efficiency savings, can be achieved via a slate of reforms commonly referred to as privatization. “Better Service, Better Price,” goes through best practices and case studies to arrive at standard cost savings of between five and 20 percent — a good step toward realizing the benefits of HB 2117. Privatization reforms include contracting, franchising, and outright divesture of government-owned assets or functions. Examples from around the country demonstrated 130 different outsourcing initiatives in Florida saving $500 million in cash-flow dollars and 345 opportunities for public-private partnerships in the City of Tulsa. The study also highlights existing efforts in Kansas such as the City of Wichita saving $1.3 million annually by outsourcing mowing operations, beginning in 2009, and Kansas State University allowing its on-campus bookstore to be operated by Varney’s, a private entity and previous competitor. In addition to case studies and establishing the vocabulary of privatization, a good deal of discussion is provided to best practices. Transparency in contracting and purchasing, truly competitive and open bidding, and quality-driven outcomes help protect taxpayer interests when government dollars go to private entities. 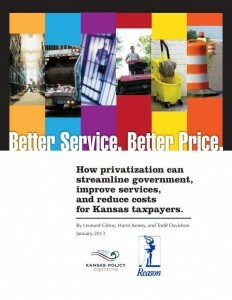 The document may be read at Better Service, Better Price: How privatization can streamline government, improve services, and reduce costs for Kansas taxpayers. The Kansas Legislature has considered privatization in recent years. Two years ago a bill passed the House, but did not advance in the Senate. The bill was HB 2194, which in its original form would have created the Kansas Advisory Council on Privatization and Public-Private Partnerships. This bill passed by a vote of 68 to 51 in the House of Representatives. It did not advance in the Senate, falling victim to a “gut-and-go” maneuver where its contents were replaced with legislation on a different topic.